revision 2 - June 2002. The preferred method of submitting a file to the nPortal spooler is by using the LPR protocol. This mechanism has the advantage that key disposition information can be described that may be useful to downstream processes and there is good scheme for maintaining multiple queues. This control file information contains commands that affect formatting, printing and job tracking. A complete description of the available options that may be found in some printing environments is in the original rfc1179 and later documents. Many of the options are obsolete but a core sub-set are implemented by many printers and supported by LPR clients on many platforms. The spooler implements an LPD service that will accept multiple connections from remote LPR clients. Entries created in the spooler are processed in accordance with a rule table that may promote incoming files. Data may be forwarded by LPR, TELNET (streamed data), EMAIL or plug-in processes. The spooler exposes a number of formal parameters that correspond closely to entries in the LPD control files and environment information. There is a syntax provided to allow actual parameters to be passed to forwarding processes. e.g. ! !LPRC; will be substituted by the actual CLASS parameter obtained from a control file. This process is best understood by examining an actual example. Programmers Information - Control File Format The LPR/LPD protocol transfers a file called "t.ppg" to a data file in the spooler folder "c:\spool\dfA083REDGHOST" (for example) and creates a control file with the following content. C <=31 Class for banner page LPRC Mostly used to describe the data type. -C parameter on NT LPR client. L <=99 Print banner page LPRL User name for banner page. Class and Job entries must come first. f <=99 Filename LPRF Print formatted file. Usage deprecated. U <=99 Filename LPRU Unlink after printing. Nportal always deletes the data file after processing. ; <16k Status COMMENT Displayed by spooler active server page interface. Internal to nPortal. Programmers Information - Plug-in programs A plugin process (free-standing program) is launched by the rule table RUN action. The full path to the relevent data file is passed as the only command line parameter. The corresponding command file can be deduced by replacing "DF" with "CF" in the filename. The spooler thread will camp on the plugin thread process until the program exits. During this time the plugin has "carte blanche". When the plug-in program exits the data file is deleted and the control file status is updated. The default behaviour may be changed by using the program exit code to supply a new printer folder in which the job is to be reproduced. e.g. In this pascal example, nQPromote('NQ!PCLJOB') would stop the plugin and cause the job to be moved to the spooler PCLJOB directory. This is intended to support ad hoc data recognition programs or job step processes. The complete CONTROL and DATAFILE is moved both may have been modified by the plug-in. Note:- The "NQ!" preamble is a signature added for reasons of security. Other methods are available to submit local jobs to the spooler. An entry may be fabricated by first creating a datafile with a unique name conforming to the above format. The control file should then be written to a temporary file and then renamed into the appropriate CF filename. e.g. 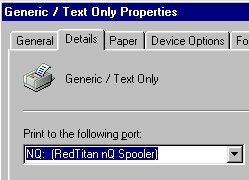 The nQ Port Monitor re-directs print files sent to a windows printer driver to the nQLPD spooling system. Any printer driver can be configured to use the nQ Port Monitor. 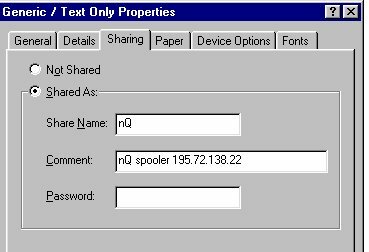 If the printer driver is shared then remote users may send files directly to the nQ spooler. A captured printer port will bypass the printer driver services. Install a new printer on the machine hosting the nQLPD spooler. Any driver may be selected. GENERIC / TEXT ONLY is sufficient for most applications. To make the printer visible to other users of The Network Neighborhood. Select the SHARING tab from the printer PROPERTIES. The rule table is processed for each valid entry in sub-directories of the spooler root directory. An entry is valid if both a CF and a DF file are present. The numeric sequence is provided by the process submitting the entry. (The remote or client LPR program). The remote host name is added after the sequence number and must start with an alpha character. Job separation is maintained by the selected printer folder and then a unique combination of sequence number and remote host name. Complex conditions are not supported by the wizard but a individual rule may be edited. If all the conditions are met the action is executed. By default, the actions associated with a single rule are single threaded. There is more documentation within the example rule table - NQRULES.XML. There is no attempt to prevent loops. Stacking actions is not recommended except for STARTS and ENDS job ticket directives associated with a TELNET command. The following actions are defined.